It was all about the guards for the Miami Hurricanes on Wednesday night. ACC Co-Rookie of the Week Lonnie Walker IV paced Miami with 19 points. He has led the team in scoring in four of its last five games and has averaged 18 points in its last eight. Walker has also scored in double-figures in his last eight games. But the night belonged to senior guard Ja’Quan Newton, who came off the bench for the third-straight game to tie a season-high with 16 points in an 87-81 victory for No. 25 Miami over Wake Forest Feb. 7 at the Watsco Center. UM freshman Chris Lykes added 13 points and five assists, and sophomore Dewan Huell secured his fifth double-double of the season with 10 points and 10 rebounds. Redshirt freshman Sam Waardenburg, who is from New Zealand, scored a career-high 12 points and hit three three-pointers. The Hurricanes (18-5, 7-4 ACC), who made it back into the AP Top 25 rankings in the latest poll released Monday, Feb. 5, have won three-straight games and five of their last six. They move to 9-0 when scoring 80 or more points and 13-0 when leading at halftime. 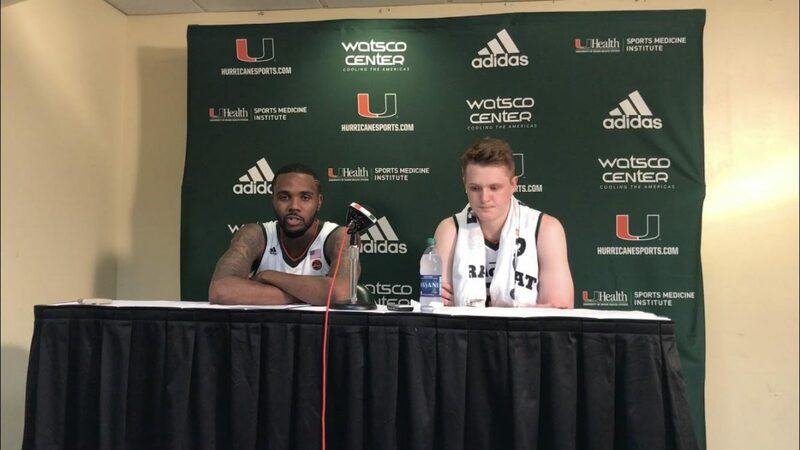 “We picked up our energy defensively, and that led to big momentum swings for us,” said associate head coach Chris Caputo, who spoke after the game because head coach Jim Larrañaga was fighting a cold. Newton has been one of UM’s primary scoring options throughout his college career, and he started the first 20 games of the season. But he was struggling, and when sophomore standout Bruce Brown Jr. went down with a foot injury last week, he was moved to a bench role. Newton made the most of it against the Demon Deacons (9-14, 2-10 ACC), who have now lost nine of their last 10 games. “It’s just about being more aggressive and just looking in the mirror and knowing that I need to go out there and be me and play my game – do what I’ve been doing my whole life,” Newton said about how he has picked up his play the last two games. He has scored in double-figures in back-to-back games. Wake Forest was led by a 23-point performance from guard Bryant Crawford, who is the team’s leading scorer averaging 16 points and ranks No. 7 in the ACC in scoring. Freshman guard Chaundee Brown had 20 points. Miami shot a season-high 37 free-throws, making 26 of them. The Canes played their third-straight game without Brown, who is out at least five more weeks after sustaining a fractured left foot. He underwent surgery Thursday, Feb. 1. “The guys who have come in have played within themselves,” Caputo said about playing without Brown. Huell, who leads UM in scoring averaging just under 13 points, left the game and hobbled to the locker room near the end of the first half after landing awkwardly on his right ankle. He would return and start in the second half. Miami looks for its fourth-straight win when it faces off against Boston College at 2 p.m. Feb. 10 at the Conte Forum. Wake Forest will try to get back on track in a matchup against Syracuse at 1 p.m. Feb. 11 in the Carrier Dome.